Headaches can greatly vary in duration and intensity. From a dull, throbbing ache to a sharp drilling sensation, headaches are never pleasant. Women undergoing the menopausal transition are more vulnerable to headaches, mainly due to hormonal fluctuations. Generally the most intense headaches are migraines, though tension and sinus headaches may also be experienced. To learn more about these three main types of headaches as well as others, read the descriptions below. A migraine headache is a recurrent, throbbing headache generally felt on one side of the head, but it can occur on both sides. It can last anywhere from one or two hours up to three days. Neurologists are more likely than any other previously-studied group to experience migraines, with 57% reporting having experienced one. Carotidynia. This is an extension of a migraine. Also called lower-half headache or facial migraine, it produces deep, dull, aching, sometimes piercing pain in the jaw or neck. Headache-free migraine. This type of migraine is characterized by the presence of aura without headache. This can occur in patients with a history of migraines with aura. Ophthalmoplegic migraine. This type comes on with pain in the eye and is accompanied by vomiting. As the pain continues, the eyelids begin to drop, also referred to as ptosis, and the nerves responsible for moving the eyes can become temporarily paralyzed. Click on the following link to learn more about the kinds of migraine headaches. There are also other types of headaches besides migraines. Continue reading to learn these other types of headaches. Tension headaches are the most common type of headache, affecting 64% of men and 88% of women at least some time during their lives. A tension headache generally produces typically mild to moderate pain spread throughout the head. The feeling has been likened to that of having a tight band tied around the head. A tension headache may also cause pain in the back of the neck at the base of the skull. Tension headaches come in two varieties: episodic and chronic. The type of tension headache largely depends on the intensity, duration, and frequency of the headache. Below are the types of tension headaches and their symptoms. 90% of men and 95% of women have experienced at least one headache in their lives. There is a third type of headache called a sinus headache. Keep reading to learn more about sinus headaches. 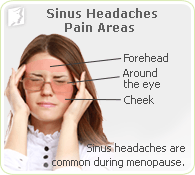 The third most frequently experienced type of headache in menopausal women is a sinus headache. Sinuses are air-filled cavities located in the cheekbones, forehead, and behind the bridge of the nose. The sinuses produce a thin mucus that drains out of the nostrils. When a sinus becomes inflamed, usually as the result of an allergic reaction or an infection, the inflammation will prevent the outflow of mucus and cause pain similar to that of a headache. A sinus headache, then, is the inflammation and blockage of the sinus cavities. This is also known as congestion or a congestion headache. Those who are accustomed to getting sinus headaches know all too well what the symptoms are. When one experiences a sinus headache, the discomfort is prominent and prevents the sufferer from concentrating on anything else. Below is a list of the most common sinus headache symptoms. In addition to migraine, tension, and sinus headaches, there are other types of headaches that are less commonly experienced and are not related to hormonal imbalance. Below is a list of the other types of headaches. Cluster headaches. Cluster headaches are relatively rare and occur in a "cluster" over a series of weeks or months. They usually materialize as short but intense headaches that can reoccur several times a day. They are far more common in men than women, especially men who smoke cigarettes. The exact cause is unknown. Medication-induced headache. As the name suggests, medication-induced headaches occur due to the side effects of a medication taken for an unrelated ailment. Ice cream headache. This headache, also known as "brain freeze," occurs whenever ice cream or other frozen foods touch the roof of the mouth, inducing a sharp pain in the forehead. Fortunately, this sensation subsides quickly. Click on the following link to explore the different causes of headaches during menopause. Daily headaches among middle-aged women are frustrating, painful, and affect millions of women every day. These headaches are primarily caused by hormone fluctuations, specifically of estrogen and progesterone. Drinking plenty of water, exercising regularly, and eating healthy are a few ways to help prevent daily headaches. Headings can be painful, frustrating, and prevent you from doing what you want to do. However, headaches do not need to be recurring or alter your lifestyle negatively. Click here to learn about four different types of headaches and what you can do to lessen and prevent headaches from happening. An imbalance of estrogen and progesterone is often to blame for headaches as women are transitioning out of their fertile years. However, there are many triggers of headaches during perimenopause that many women may not realize is causing or exacerbating the symptom. Learn five of them here.